The October breakfast is the 3rd Anniversary of The New Media Breakfast; yes, it’s been three years since we started or monthly knowledge sharing events. We are pleased these have now become part of the regular calendar of new media events. We also thank Tigerlily for all of their support in the past; they really make it easy to host an event of this nature. We also take this opportunity to thank everyone who has attended the breakfast since we started, we hope you enjoy coming along as much as we enjoy hosting them. We appreciate your support and hope you will continue to come along to the events. 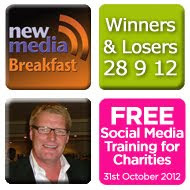 The October New Media Breakfast will explore social media winners and losers. This is a topic we’ve had requested in the past so we’re pleased to be able to bring it to you now. ROI is a question we’ve been asked about numerous times, hopefully this breakfast will help you identify the possible returns you can expect by exploring some social media winners. We will look at examples where brands have used social media tools to become social and how they succeeded in their objectives. We are looking for assistance from you; do you have a social media success story or, do you know about a success that you would like us to highlight? Equally, please let us know if you know of any failures that we could perhaps review and share with your New Media Breakfast colleagues. We hope you can make it along to this important breakfast to help us celebrate three successful years of New Media Breakfast and perhaps learn from other winners and losers. We would also like to draw your attention to a very important event we are hosting in No.29 on the 31st October – a FREE Social Media Training Day for charities. This event is strictly on a first come first served basis so, if you know any charities that may benefit form the day please share the information about the day with them. You can find out the full detaisl and programme for the Charity Training Day here.